➢ “It would take a geologist to identify all the strata of nostalgia in Netflix’s Wet Hot American Summer: Ten Years Later. In the original 2001 film, a sweet-hearted spoof of raunchy teen comedies, actors in their 20s and 30s played kids on their last day at Camp Firewood in 1981. The 2015 prequel series, Wet Hot American Summer: First Day of Camp, returned much of the group to play the same characters a few weeks younger. Now, the eight-episode sequel to the prequel returns for a reunion set in 1991, meaning the actors now play characters roughly the age they were when they made the original movie.” — New York Times. 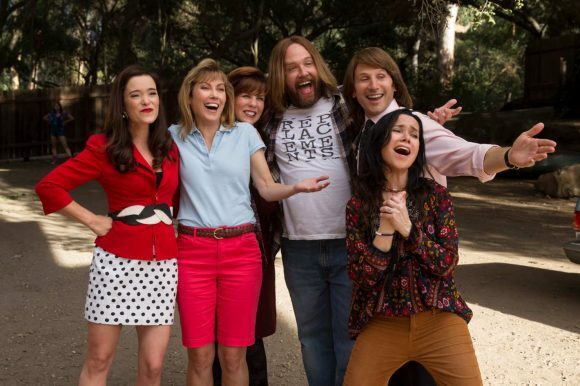 ➢ “It’s one of those odd modern programming miracles that Wet Hot American Summer, a movie that made under $300,000 at the domestic box office in 2001, built enough of a cult following to spawn the Netflix prequel series Wet Hot American Summer: First Day of Camp … Wet Hot American Summer: Ten Years Later isn’t an example of going to the well once too often, but it definitely exhibits a fatigue that the first two installments didn’t have.” — The Hollywood Reporter. ➢ “Franchise creators and executive producers David Wain and Michael Showalter hit the bottom of the bug juice barrel in this eight-episode installment. The scatological jokes run high, while some of the action sequences are worthy of a C-level thriller … The finale has more epilogues than The Lord of the Rings: The Return of the King. Sometimes you just need to know when to say goodbye.” — Boston Herald. ➢ “Honestly, there are only a couple of gags and giggles to be had out of Ten Years Later, the distinctly plotless and oddly nostalgia-bleached eight-episode sequel … Even with the combined star power of Amy Poehler, Paul Rudd, Janeane Garofalo, David Hyde Pierce, Molly Shannon, Big Sick director Michael Showalter, Christopher Meloni, and Elizabeth Banks along with Chris Pine, Kristen Wiig, Lake Bell and Josh Charles and new additions that include Adam Scott and Alyssa Milano, Ten Years Later (yes, set 10 years after the 1981-set prequel series) just feels old.” — Deadline Hollywood. ➢ “Has a strong improvisatory, ‘let’s just run with this’ streak running through it at all times. If you told me some of these episodes were shot a few minutes after the first or second drafts of the scripts were yanked off the printer, I’d say, ‘I guess that makes sense.’ In this case, I mean that as a compliment. Wet Hot American Summer: Ten Years Later is fun precisely because it seems to be flying by the seat of its early-’90s jeans, feeling free to do whatever it wants, any old time.” — New York magazine.